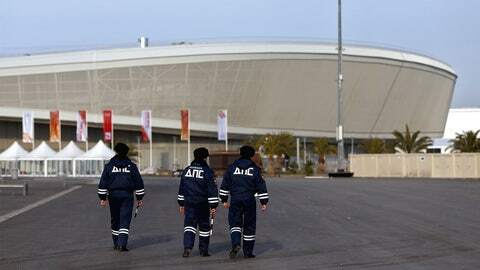 Security personnel walk in the Olympic Park on Jan. 9. On Sunday, a US congressman said Russian officials 'aren't giving us the full story' on the challenges facing the Games. Members of Congress expressed serious concerns Sunday about the safety of Americans at next month’s Olympics in Russia and said Moscow needs to cooperate more on security, all while a video was posted to a militant website that makes a threat against the Games. The heightened concerns come on the same day that a video surfaced on a known terrorist website, showing two young men believed to have been suicide bombers in the back-to-back bombings in Volgograd speaking of those attacks and making an ominous promise. "We’ve prepared a present for you and all tourists who’ll come over," the video says. "If you will hold the Olympics, you’ll get a present from us for the Muslim blood that’s been spilled." ”All the briefings that I’ve received, from the intelligence community to the FBI and others, indicate that there are serious concerns, and that we need to do a lot to step up security. I do believe Putin is doing a lot of that,” said McCaul, R-Texas. ”I would not go, and I don’t think I would send my family,” said Sen. Angus King, I-Maine.